Felix Garcia is the National Sr. Vice Commander of The Military Order of the Purple Heart. He is a retired Marine. He was medically discharged from the United States Marine Corps after being wounded in combat while serving his country in Iraq during 2004. Felix was awarded three Purple Hearts. 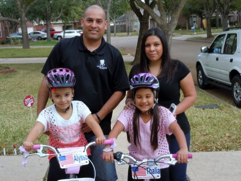 The Garcia Family came to the attention of Operation Red, White and Bike after their two young daughters were nominated and approved as little heroes. Once bicycles were awarded to these young ladies, you could tell that Felix and his wife Christina loved what we do and wanted to get more involved with honoring children and younger siblings of combat wounded soldiers and soldiers killed in action. They know firsthand the impact that our program has on these young children and their families.